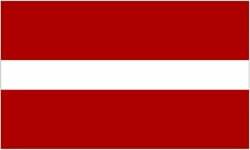 Latvijs is a nation led by Minister President Fiberts Roinks on the continent of Europe. Latvijs's government is a Parliamentary Republic with very moderate social policies. Economically, Latvijs favors left wing policies. The official currency of Latvijs is the Dollar. At 13 days old, Latvijs is a new nation. Latvijs has a population of 1,005 and a land area of 250.00 sq. miles. This gives it a national average population density of 4.02. Pollution in the nation is almost non-existent. The citizens' faith in the government is at an all-time high with an approval rating of 100%. 04/22 04:37 pm - Vanek26 removed Latvijs from the alliance Guardian. 04/10 02:07 pm - Latvijs applied to join the alliance Guardian. 04/10 01:41 pm - Latvijs was created!